Please click on a logo below to submit an online testimonial for Feinerman Vision Center. For your convenience, you can use the online service that you already are a member of, so all you need to do is submit a review without the need to register or sign up. I’ve been wearing glasses ever since I was a kid and started wearing contact lenses for over 10 years. I’ve always had problems seeing without contact lenses or glasses and now I’m finally glasses free!!!!! I had LASIK procedure with Dr. Feinerman yesterday and I think this facility has to be one of the best in the world. The doctor and his staff are obviously experts, they know how to set patients at ease, and communicate expertly at every stage of the process. My sister and I had procedure done yesterday, and I’m sure will be just as happy as I am! No hassle with glasses or contacts!! I AM SOOOO EXCITED FOR MY NEW EYES!!!! THANK YOU DR. FEINERMAN What you do for a living is truly amazing! I was so scared to have anything done to my eyes. Just the idea of getting LASIK made me limp and feel as though I might pass out! However, I had gotten to the point where I couldn’t see a thing beyond my elbow and was missing out on friends waving hello, and a lot of life’s simple pleasures. My mom wanted me to get the surgery for reasons of safety. She didn’t want a bad guy lurking in a dark corner and me not see him. I’m glad Dr. Feinerman was able to calm my nerves for 24 hours, long enough to get me through my consultation and into my surgery appt the next day. Dr. Feinerman was so wonderful, not to mention gorgeous! All my girlfriends developed sudden cases of poor eyesight, haha! All in all, I’m so glad Dr. Feinerman was my doctor. He talked me through the whole procedure, and got me through it all with humor, professionalism and, of course, his amazing staff. I’m so happy today! I actually loved my whole experience and adore him and his staff. I whole-heartedly recommend Feinerman Vision Center, especially to all those scaredy-cats out there such as myself. 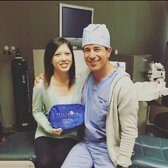 After going to numerous LASIK consultations at some of the most popular LASIK centers in Orange County and spending countless hours on research & studies, I decided to go with Dr. Feinerman for my LASIK procedure and really couldn’t be any happier. At my consultation, Dr. Reimers (the optometrist) took all my scans & measurements. She then checked my eyes very thoroughly and entered all her findings into the computer. Be prepared to have your eyes dilated, a step that is necessary in order for the doctors to examine more closely at the condition of your inner eye(s). *This is where FVC is different! * Other places will only proceed with this step if you decide to commit to having LASIK done with them (usually this requires a second appointment). They will even have you pay upfront for the dilation, but will say it is deducted from the overall fee…in other words, putting down a deposit and forcing you to commit to them. Ask yourself this: Why do you need to wait until the 2nd appointment for them to perform a more “complete” exam? With FVC, there are no gimmicks whatsoever. They dilate your eyes at the initial consult & do their best to determine whether you are truly a candidate for LASIK the FIRST time. What really stood out for me was that even after Dr. Reimers performed a thorough exam, Dr. Feinerman came in to check my eyes again before he gave the official OK. FVC was the first and ONLY place that actually allowed me to meet my surgeon and ask questions right away. I have a lot of friends that had LASIK done with other surgeons and they did not even meet the surgeon until right before the procedure. Needless to say, it is so much more reassuring to be able to meet my surgeon beforehand and establish some rapport. First, you will come in & sign some routine paper work. The technician will go over everything you’ll need to do post-op and then give you a Xanax to help calm your nerves. The surgical tech will then set you up and put a lot of eye drops (anesthetic, etc) in your eyes. Dr. Feinerman talks you through every step of what he’s doing and instructs you exactly what to do. The Ziemer used to create the flap is completely painless, you’ll just feel a bit of pressure like something is pressing down on your eye. There is a blackout phenomena in which your vision will go dark, but its very brief and didn’t freak me out at all. When the corneal flap is lifted, your vision will just look a little fuzzy. You will be asked to focus on a red light when the excimer laser is being used. To me, that was probably the hardest part because I couldn’t tell whether my eye was still or moving around. But rest assured, the lasers are equipped with automatic eye trackers that monitor eye movements and keep the laser on target during surgery. There is a very slight burning smell, but you do not feel any heat whatsoever. Right after the procedure, my vision was a bit hazy, but I could tell that it was much better. During my ride home, I could even read the street signs! After about an hour, my eyes started to sting and I knew that was my cue to go take my nap. I woke up 4 hours later and my vision was already so clear! The next day at my post-op, I found out my eyes were already at 20/20. It’s amazing to be able to see so clearly and I feel so appreciative that Dr. Feinerman has helped me achieve this! 3) He invests in the latest & safest technology and doesn’t hesitate to use them just because of royalties. 4) He only performs LASIK on Fridays, which means he is more readily available to play more of an active role in follow-ups. At other vision centers, it is likely you won’t see the surgeon again. Follow ups are taken over soley by in-house optometrists or co-managed by outside optometrists. 5) The unbeatable price! Don’t be fooled by the “lifetime guarantee” or “lifetime commitment” deal at other places for an additional $1000 plus. There’s ALOT of fine print. They’ll only do an enhancement IF your eyes are eligible down the line, so technically that’s not really a guarantee. At the end of the day, there are a lot of great surgeons out there and it can be extremely difficult to decide who to go with. After going thru my extensive checklist, the deciding factor for me was choosing a surgeon that provided me with a personable experience. One I can confidently build a patient-doctor relationship with and trust that I wouldn’t be treated like just another number. One day post-op. Surprised to find out I was 20/20! Literally minutes after my LASIK procedure! I can’t believe I put LASIK off for as long as I did. I went in to Dr. Feinerman’s office for a consultation on Thursday and had the procedure done the next day. The entire process was very quick, easy and painless. He talks you through the procedure and his demeanor really puts you at ease. The staff was super friendly also. I went home after the procedure, slept all night without pain or issues and woke up with unbelievably clear vision. Dr. Feinerman came in to his office the next day on his day off, a Saturday, to accommodate MY schedule and do my follow up exam. I left the exam with 20/15 vision and couldn’t be happier with the results. Thanks again Dr. Feinerman! My both eyes were foggy totally that affects my life, my business, my…everything!!! I found Dr Feinerman on Yelp and…I am reborn again, I reclaimed my life. Thanks to the performance of cataract surgery by Mr. Feinerman, Great doctor, great staff too and I wont forget the “Royal treatment” from the Doctor And all of his medical assistance staff and the out patient surgery clinic. I reward Feinerman Vision Center 5 stars as there was no 6* available. I had LASIK surgery just over 3 months ago, and I couldn’t be happier! I did a lot of research before choosing to go with Dr. Feinerman. I felt confident that he would do an amazing job, and he did! Both my eyes were 20/15 after my surgery. I haven’t had any problems with dry eyes, etc. I have recommended him to multiple friends already, and I highly recommend that YOU choose him as well! 3/7/2016– Just had LASIK done this past Friday by Dr. Feinerman, and thrilled about the results! I would definitely recommend Feinerman Vision Center for all of anybody’s eye care needs. I had the best experience ever. From my consultation to my post op. Dr. Feinerman knows what he is doing. I felt like a person and not another number walking through his office. I came in Wednesday for a consultation, loved the care and environment. I met Dr. Feinerman that day compared to my other place I had a surgery set with, I didn’t meet the surgeon. Loved my experience at Dr. Feinerman’s and so I cancelled my surgery with the other company on Thursday, which was twice as much as what I paid with Feinerman Vision. 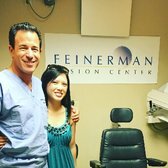 I was able to schedule a surgery on Friday morning with FEINERMAN vision. I’m so happy he was able to fit me in as soon as possible. Today was my surgery and I just woke up from my nap. I have had glasses/contacts for 17 years and I was so overwhelmed with joy when I woke up and I could see everything clearly. I could not be happier. Preop was easy, I was nervous and excited. When I walked into the surgery room, Dr. Feinerman was playing DRAKE!!! And I love Drake! And he also played some Jay-z and more. I felt very comfortable. It was a quick and easy procedure. I’m very happy with my results and it’s only been 9 hours afterwards lol. After I posted him on my Instagram and snapchat, all of my friends started texting me telling me how they’ve been interested in LASIK and I told them to definitely go to Dr. Feinerman! I have no regrets. I got LASIK done by Dr Feinerman to correct my nearsightedness and astigmatism. He did a fantastic job and I could see right away. The healing process was a breeze. I still can’t believe how clearly I can see without having to wear any contacts or glasses. Dr Feinerman is very friendly and down to earth. He has a very calming and happy energy about him. After my initial consultation, I knew that I could trust him to do my surgery and I scheduled it for the very next week. Dr Reimers is very nice as well. The staff is very welcoming and friendly, too. I am extremely satisfied with my vision, and the only regret I have is not getting LASIK done sooner. -KOBE’s been there. Enough said. But in all seriousness, if you want a place that’s friendly, efficient, and gives a good price I would highly recommended this place!